Cases By Pelican offers custom cut foam inserts for all sizes of their popular and rugged Pelican cases. Contact them directly with your measurements or CAD drawings if you need foam to fit your weapons, cameras, tools, intruments or other prized items. Caron Forensics has started offering this Rapid Access Defense weapons storage system. It’s a steel box that mounts to a wall with rails inside that a variety of weapons, tools, and flashlights can be mounted to. It’s lockable, but with a key allows quick access in case of an emergency. 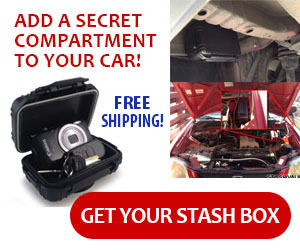 CovertFurniture.com is a newer company that specializes in secret compartments in furniture. This headboard can be made with 2 or 3 pop-out handgun compartments, depending on the bed size, allowing for easy access even when lying in bed. This concealed carry guitar case, featured on the Firearms Blog, has been modified to secretly transport a Glock 23, an AR-15 and plenty of ammo. This table quickly breaks down into a bat and shield.